Kathakali is a classical dance form of Kerala, demanding long years of training. 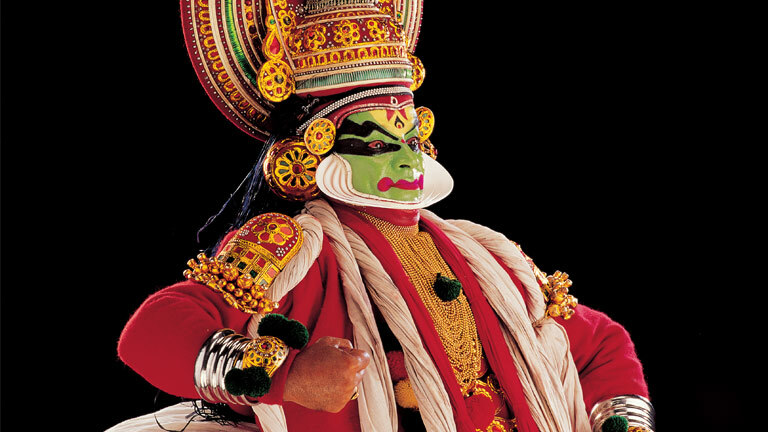 Believed to have evolved from Ramanattam, another classical art form composed by Kottarakkara Thampuran, Kathakali incorporates the techniques of some of the major ritual art forms of Kerala. The characters of Kathakali do not speak and the story is presented through songs from the background. This makes Kathakali music a very important component of this art form. The text of Kathakali songs is known as Attakkatha. Chenda, Maddalam, Chengila and Elaththalam are the instruments used with Kathakali music. Like most other classical dance forms of India, Kathakali is also based on Natya Shastra, the ancient treatise on dance, written by Sage Bharata. However, Kathakali relies on Hasthalakshana Deepika, another classical text for its hand gestures. A Kathakali performance has different components or steps. They are Keli, Arangu Keli, Thodayam, Vandana slokam, Purappadu, Melappadam, Kathabhinayam and Dhanaashi. It needs 6 to 8 hours to present the complete version of a Kathakali play. The spectacular costumes and colourful make up are the other major features of Kathakali. It takes 3-5 hours for the facial make up of most of the characters. The make up and costume of characters are designed to highlight their characters. To perform Kathakali, an artist needs minimum 4 to 5 years of training. Kathakali was in peril and on the verge of extinction in the beginning of 20th century. Renowned Poet Vallaththol Narayana Menon and Manakkulam Mukunda Raja took the initiative to set up Kerala Kalamandalam, a centre of excellence for classical art forms at Cheruthuruthy in Thrissur. Since then Kerala Kalamandalam works for the revival of this great art form. Stories for Kathakali are often taken from Hindu mythology and Indian epics. Kottayaththu Thampuraan, Unnayi Warrier, Irayimman Thampi, Vayaskara Moos etc. are some of the major contributors of Attakkatha or the text for Kathakali. The main Kathakali plays include Kalyana Sougandhikam, Nala Charitham, Uththara Swayam varam, Duryodhana Vadham, Bali Vadham , Santhana Gopalam etc.